Tattoo provides more means for Filipinos to be connected to the Internet with its latest roster of Android tablets offered at entry-level price points, extending its current array of touch-based gadget offerings. 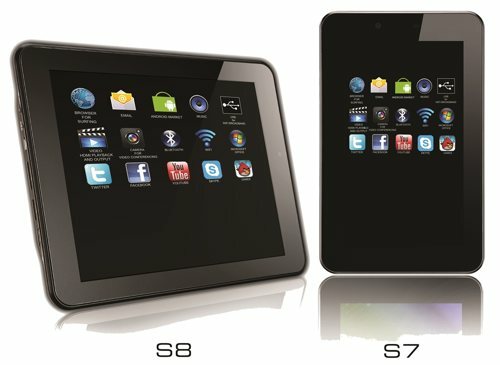 The country’s most reliable mobile broadband introduces Skyworth S7 and Skyworth S8, two new affordable tablets both available through prepaid and postpaid plans which will fit the budget and browsing needs of the value-conscious market, particularly young professionals as well as parents who want to excite their kids with their very own computing devices which they can use in school. Avail of the tablets that come with a free Tattoo Wi-Fi stick starting at consumable postpaid Plan 299 with cash-outs of P3,999 for the S7 and P6,499 for the S8; or for Plan 499 with lower cash-out payments on the S7 at P2,499 and the S8 at P4,999 over a two-year contract period. Enjoy unlimited browsing at Plan 999 for both gadgets, with cash-outs of only P1,499 for the S7 and P1,999 for the S8. Consider getting the S8 at Plan 999 and realize savings of more than P9,000—a cheaper proposition than purchasing the tablet separately with a postpaid Tattoo Wi-Fi Stick. Or save big by getting the S7 at P5,399 or the S8 at P7,499 on a prepaid basis—both with the Tattoo Wi-Fi stick worth P2,895, absolutely free—through straight cash payments or credit card at 0% interest up to six months. Given these exciting new deals, Head of Tattoo Nomadic Broadband Business Dong Ronquillo offered insights on the popularity of tablets, saying that “Tablets are becoming more popular and are foreseen to surpass computers in the future. The cost of laptops, PC desktops and some smartphones are still prohibitive to others. With affordable tablets such as the Skyworth S7 and S8, more users like yuppies and students now have cheaper and more convenient options to access the Internet as provided by these innovative Tattoo bundle offers.” Both gadgets beef up Tattoo’s present tablet line-up composed of the iPad with Retina Display, the iPad mini and the Huawei Mediapad. “Through its wide option of affordable broadband plans with bundled devices such as the Skyworth S7 and S8 tablets, Tattoo’s presence in the growing tablet category is strengthened by letting Filipinos experience broadband innovation and giving them more value for their money. We want more subscribers to enjoy the speed and reliability of Tattoo in all price points across all market segments.” he added. The Skyworth tablets run on the latest Android 4.1 Jellybean OS and are powered by 1 GB RAM and Cortex processors, with ARM A8 at 1 GHz for the S7 and Dual A9 at 1.6 GHz for S8. Newbie workers and students will find it ideal to access the internet through the said devices via Wi-Fi connectivity from plan-bundled Tattoo Wi-Fi sticks and surf the internet at superfast speeds. With the built-in Google Play, downloading applications from productivity sites to games, files and content becomes promises to be a fun experience. For more information, head on to tattoo.globe.com.ph, call (02) 730-1010, visit the nearest Globe store or get in touch with authorized Globe Sales Agents.